New book, 306 pages. 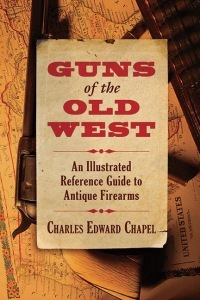 Written by one of the foremost firearms experts of the twentieth century, Charles Edward Chapel’s Guns of the Old West is an exhaustively researched document that not only boasts a significant collection of antique Western guns, but also categorizes the firearms into easy-to-reference sections. Starting with an introductory chapter on the origins of guns and their earliest uses on the frontier, Chapel covers everything from muskets to rifles, pistols to revolvers, and shotguns to martial arms. Three whole chapters are dedicated to the rise and fall of the famous Deringer pistol. And as much as Guns of the Old West is an encyclopedic reference manual, it’s also fascinating historical literature that frames the world in which these guns were used. Buffalo guns and hunters are covered, along with martial arms of the post Civil War era. The gun collection of famous collector and hunter President Theodore Roosevelt is given its own chapter. Illustrated with nearly 500 illustrations, as well as important artwork from the Western period from artists such as Frederic Remington, Guns of the Old West is an essential work for gun collectors and American history enthusiasts.